THE OAKLAND RAIDERS are moving to Las Vegas in 2020. The NFL owners approved the move today on a 31-1 vote, with the Miami Dolphins the lone team that voted in opposition. 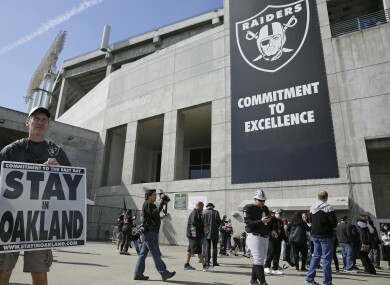 “My father always said, ‘the greatness of the Raiders is in its future,’ and the opportunity to build a world-class stadium in the entertainment capital of the world is a significant step toward achieving that greatness,” the franchise’s owner Mark Davis said in a statement. “The Raiders were born in Oakland and Oakland will always be part of our DNA,” he added. “We know that some fans will be disappointed and even angry, but we hope that they do not direct that frustration to the players, coaches and staff. Wow. Mark Davis said fans who had already put down season ticket deposits for the #Raiders can get refunds. Class move. The Raiders are planning to build a 65,000-seat domed arena in Las Vegas. They’re set to play at least one more season in Oakland and have the option to renew their lease at the Coliseum in 2018. They may opt to share Levi’s Stadium with the San Francisco 49ers in 2019. Email “The Oakland Raiders are moving to Las Vegas after landslide vote in favour of relocation”. Feedback on “The Oakland Raiders are moving to Las Vegas after landslide vote in favour of relocation”.